Nissan Altima offers a solid road feel, sporty handling and snug comfortable interior. 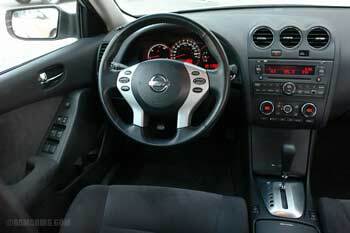 The Altima comes as a sedan or two-door coupe, with a 4-cylinder or V6 engine. Transmission choices include a six-speed manual or continuously variable automatic transmission (CVT). 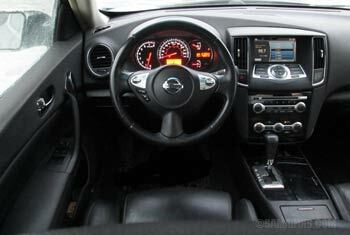 The Altima's interior is sporty and nicely-finished. Front seats are comfortable and supportive. The steering tilts and telescopes. Available features included Push Button Start, Bluetooth, HID headlights and Navigation with Rear-view camera. The Altima is rated above average for the reliability, but there are a few things to watch out for when buying it used. Engine: The base 170-hp 2.5L 4-cylinder DOHC engine (QR25) is good on gas and has decent power. Overall, it's a pretty good engine. The praised VQ 270-hp 3.5L V6 is very strong, smooth and refined. 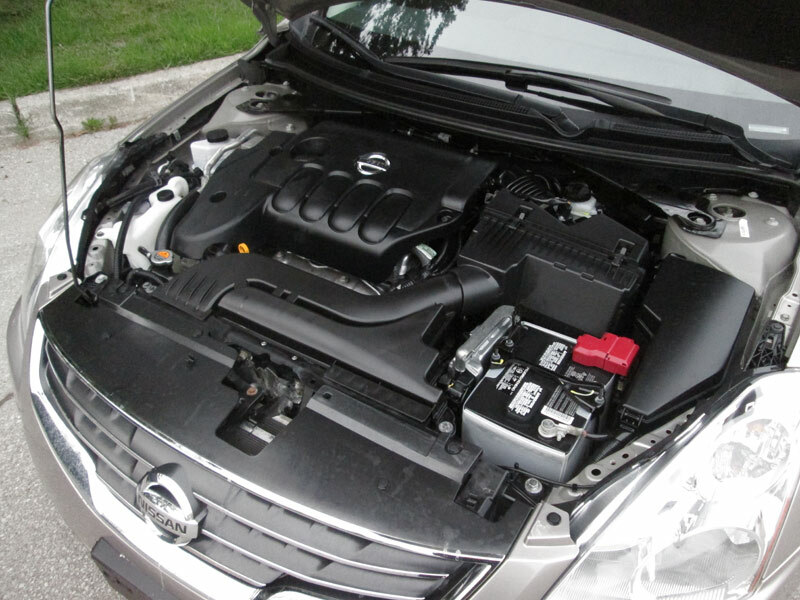 The VQ engine has been used in many other Nissan vehicles since early 00's and is proven to be very reliable. Fuel Economy: The 2007 Altima with a 4-cylinder engine and a CVT transmission is rated at 23/31 mpg (10.2/7.6 L/100 km) city/highway, which is better than most family sedans. For example, the 4-cylinder, automatic Toyota Camry gets 21/30 mpg; the 4-cylinder auto Honda Accord is rated at 21/31 mpg. On one 20-gallon (75.6 liters) fuel tank, the 4-cylinder Altima with a CVT gets an estimated 522 miles (840 km) with mostly highway driving. The V6 Altima is rated at 20/26 mpg (11.8/9.0 L/100 km) on premium gasoline. Lineup: The 2007-2012 Nissan Altima sedan was offered in base 2.5, 2.5 S, 2.5 SL trims with a 4-cylinder engine and 3.5 SE, 3.5 SL (3.5 SR from 2010) with a V6, as well as Hybrid. The 2010 Nissan Altima hybrid is rated at 35/33 mpg (6.7/7.1 L/100 km) city/highway. Mechanical: The Altima has disc brakes on all four wheels. Antilock brakes were optional on 2007 4-cylinder models, standard on V6. Electronic stability control was optional in early models, standard on all trims from 2010. Timing belt or chain: Both the 2.5L 4-cylinder engine and 3.5L V6 have a timing chain; there is no timing belt. A timing chain doesn't need to be replaced in regular intervals. What is a Continuously Variable Transmission: The CVT uses a steel belt running on two pulleys that can vary in size, changing the gear ratio continuously, without shifts. The main benefit of the CVT is that the engine RPMs stay in the most fuel-efficient range. The CVT is commonly known for its 'rubber band' effect, however, Nissan CVTs are more refined, especially in V6 models. Read more: Pros and cons of buying a car with a CVT transmission. Handling and ride: The Altima handles well, with good road feel. The ride is firm, but not punishing. The 4-cylinder engine is a bit noisy on acceleration; otherwise, it's a fairly quiet car. 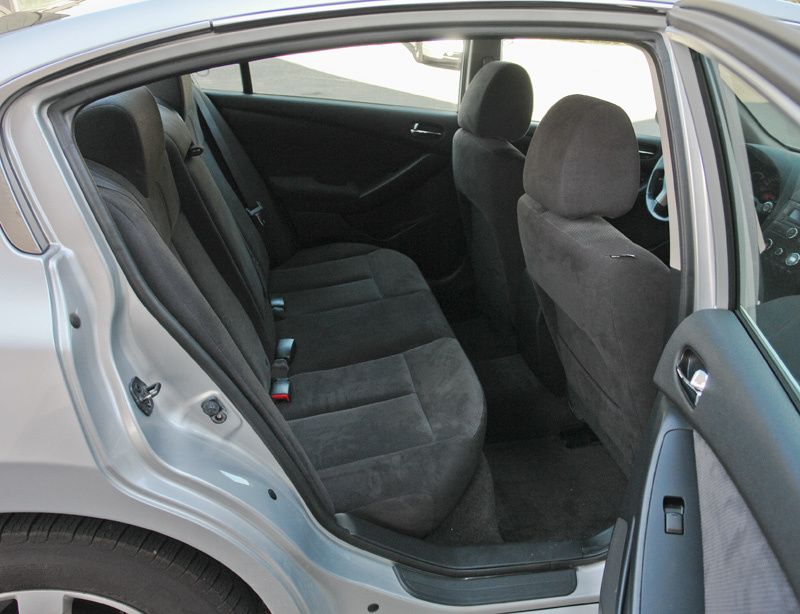 Safety: The 2007-2010 4-door Altima received five stars in the government frontal crash tests. In the side-impact crash tests, the 2007-2010 models received five stars for the driver protection. Rear passenger protection scores varied between four and five stars. In tougher NHTSA crash tests introduced in 2011, the 2011 and 2012 4-door Altima received four stars in frontal and five stars in side-impact crash tests. Check Safercar.gov for details. Pros: Sporty styling in and out, originally looking coupe, good handling, above-average reliability, crash test scores, fuel economy for 4-cylinder models. Cons: Rear seat space is average for the class, the CVT is the only automatic choice, troublesome Tire Pressure Monitoring System. 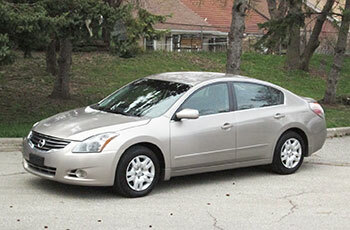 Nissan Altima Reliability: Consumer Reports rates a used Nissan Altima as 'Good Bet'. While the Altima doesn't have major problems, it's not as reliable as Honda Accord or Toyota Camry. There are some issues with a CVT transmission, although the CVT warranty has been extended for some model years. A faulty brake light switch can cause a variety of problems, including a no-start. This problem is easy to diagnose as the brake lights stop working when the switch goes bad. The repair is also not very expensive. A leaking oil cooler gasket is reported often. The oil drops appear on the passenger side of the engine. The repair is $250-370. Loose exhaust heat shields can produce rattling noises from underneath the car; the common fix is to secure the heat shields with worm gear clamps. Several owners reported the brake master cylinder leaking brake fluid. Nissan issued Voluntary Service Campaign PC125. Noisy brakes are not uncommon. A bad wheel bearing can cause a humming noise noticeable at high speed. The noise gets louder when changing lanes. The replacement of the wheel bearing costs from $280 to $400. There are some complaints about the CVT too; in response, Nissan has extended the CVT warranty to 10 years / 120,000 miles on all 2003-2010 CVT models. Read more: Is a CVT transmission reliable? What to look for when buying a used Nissan Altima: Check the history records to avoid cars that were previously damaged in accidents or flooded. Check all the accessories inside: the air conditioner, windows, the audio system, etc. During a test-drive watch out for a whining noise that is more noticeable at higher speeds; it could be caused by the CVT. Read more: What to watch out for when buying a used car with a CVT. A humming noise from the wheel area that is more pronounced at higher speeds can be caused by a bad wheel bearing; replacing a wheel bearing could cost from $350 to $500. See if the driver's seat shifts during turns, there are some complaints about this issue. If the engine rattles at a cold start, avoid the car. Read more: How to inspect a used car, guide with photos. It might be a good idea to pick the Altima model without Tire Pressure Monitoring System. Before buying, have the car properly inspected by a mechanic. Nissan recommended using premium gasoline for early V6 models; check your owner's manual. If your car doesn't start with a push start button, check if the brake lights work. If the brake lights don't work, have the brake light switch checked. Follow this link if you need to download an electronic owner's manual. Here you can check the maintenance schedule. Cargo Volume: 15.3 cu. ft. 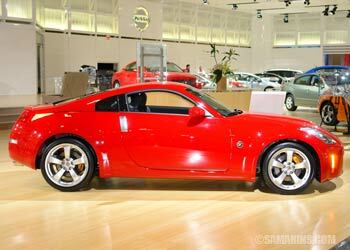 The rear-wheel drive 350Z comes with the famous V6 VQ engine. You can pick between a 5-speed automatic or 6-speed manual. The 2007 auto is rated at 17/24 MPG, but you can get it from 0 to 60 mph in 5.3 seconds. The cabin is tight, but it's one of the few affordable real sports cars. The front-wheel drive sporty Maxima also comes with the V6 VQ motor. 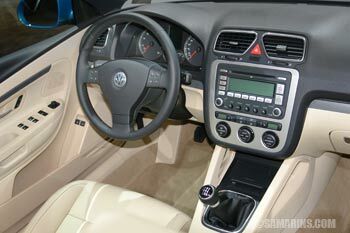 What made it so attractive was the superb handling highlighted by the sharp interior. With the CVT, the 2007 Maxima is rated at 19/25 MPG. 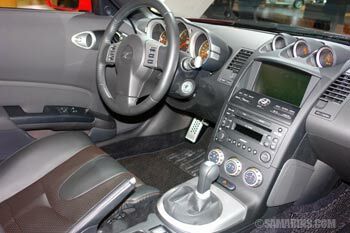 The Eos comes with a manual and a 2.0L turbo. 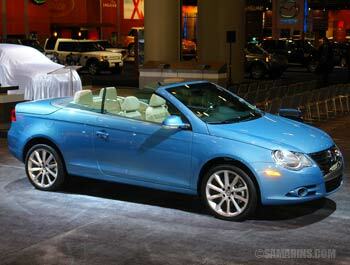 It's one of the most fuel-efficient convertibles at 21/29 MPG.